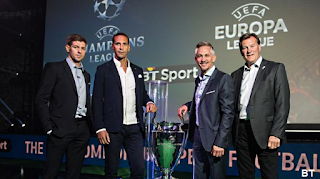 BT has unveiled its plans for the next football season, along with the launch of two new channel as BT Sport takes over the rights for Champions League and Europa League football to sit alongside its existing portfolio of football coverage. 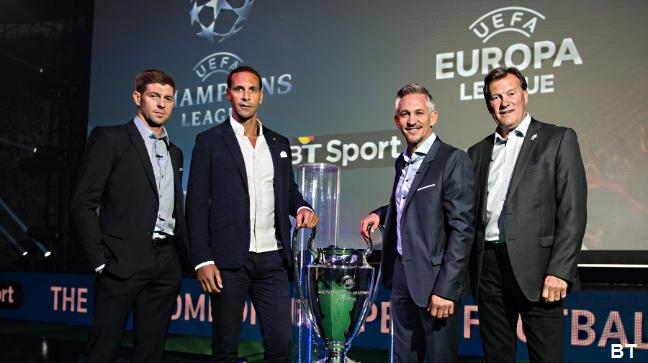 Gary Lineker, Jake Humphrey and Rio Ferdinand will front the live UEFA Champions League coverage on BT Sport. They will join the BT Sport team which includes Paul Scholes, Michael Owen, Steve McManaman and Owen Hargreaves, as well as new signings Steven Gerrard, Harry Redknapp, Glenn Hoddle and Howard Webb. BT Sport will also broadcast a new ‘Goals’ show, presented by James Richardson, where viewers can tune in on Champions League nights to enjoy news and action across all eight games as it happens. A Red Button service will allow BT TV viewers to switch between matches and track the action with a new ‘Goal Alert’ function which will let the viewer know when a goal is scored in any of the games and check the latest stats. What you get on which channel number depends if you subscribe to Sky HD or not. ESPN in the UK is now known as BT Sport ESPN. BT Sport Europe SD/HD launches 1st August 2015. It has appeared on Sky and BT TV channel lists today. Only BT Sport 1 will be free to all BT customers. Viewers will continue to access BT Sport 1, 2, BT Sport Europe and BT Sport ESPN for free if they have BT Broadband and BT's TV service. Access to the HD versions of these channels will now cost £4 extra a month. BT customers who access BT Sport via the Sky digital satellite platform will pay £5 a month. You need to opt-out if you don't want to pay more - if you don't want to pay extra you can downgrade to receive BT Sport 1 only. Non-BT customers (excluding Plusnet) who receive BT Sport via satellite: £19.99 a month for standard definition, single screen access. HD and multiroom cost extra. Terms and conditions apply, see bt.com/sport for more information. TalkTalk YouView box owners should be able to see free-to-air channel BT Sport Showcase on channel 59, but there's no sign of the rest of BT Sport arriving on TalkTalk TV yet. Plusnet customers are still able to sign up to BT Sport via Sky for £9.99 a month from August. This includes all BT Sport channels. HD costs extra.